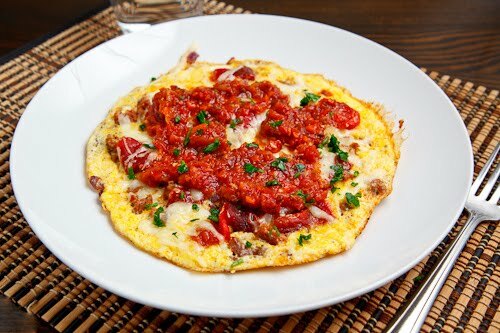 An omelette with spicy Italian sausage, sweet roasted red pepper and melted cheese covered in a tasty marinara sauce. Late summer and early fall is the time for roasting red peppers and I have already roasted a ton of them! Before I threw all of them into the freezer to enjoy throughout the winter I could not resist using a few of them and I knew just what I wanted to do with them. I had a pair of spicy Italian sausages in my freezer that had just been calling my name and I was thinking that pairing them with the sweet roasted red peppers in an omelette for breakfast would be really nice. I kept things pretty simple starting with some onion, a bit of garlic and the sausage which I sauteed in a pan before topping with the eggs to form the omelet. Since I am hopelessly addicted to cheese there was no way that I was not going to cover and/or fill this omelet with melted mozzarella and parmesan! At this point the omelette would have been great but I had one more trick up my sleeve as I was going to top everything off with a tasty marinara sauce ! I always have a hard time choosing between making omelettes so over the last few days I have been alternating between them. What a great way to start the morning on these cooling early fall days! Heat the oil in small no-stick pan over medium heat. Add the onion and saute until tender, about 3-5 minutes. Add the garlic and sausage and cook until the sausage just starts to brown, breaking it up as it cooks and set aside. Turn the heat down one notch and pour in the eggs. When the eggs just starts to set, after about a minute, sprinkle the sausage over half of the eggs along with the roasted red pepper and the cheese on top. Cook until the eggs are just about set fold the side that is not covered over the other side and slide it onto a plate. Pour the marinara sauce over the omelette and garnish with parsley. amazing recipe collection with gorgeous cliks.. This sounds great! I usually pour fresh salsa on my omelets, this is going to be a wonderful change. I'd happily eat this for breakfast, lunch or dinner! Love the colours and flavours. That last photo almost makes it seem like an omelette pizza! this combination is a great one. Roasted red peppers and sausage were meant to be mixed together! This looks fantastic, Kevin. We usually pour salsa or green chile sauce over our omelets. I love the idea of a marinara sauce. 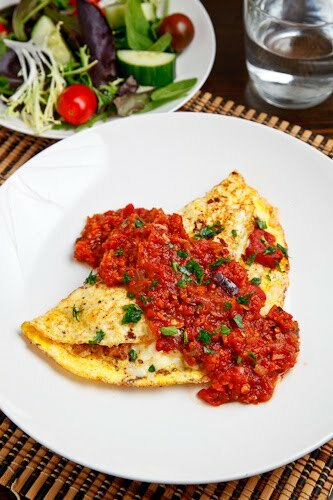 Wow I don't think I've ever considered pouring marinara over an omelette, but it makes sense! Thank you for sharing. Looks delicious! I'm a little confused about the directions, though. The sausage is added in step 3 and again in step 5. Is it divided? I am definitely going to use this recipe–we're working on cutting back on wheat and grain-based stuff but adore pasta and Italian dishes, and this sounds like a perfect transitional combination! Delicious. My boyfriend is just going to love this one! Mel: In step 3 you remove the sausage from the pan and the you add it to the omelet in step 5. You could leave it in the pan and pour the eggs in around it if you prefer. Last week while I was enjoying my lentil stew with Italian sausage and kale I noted how green it was. One thought led to another and the next thing that I was thinking about was red lentils and how a red lentil stew would be nice. Since I still had the remaining half a pound of the Italian sausage that needed to be finished the choice was easy to make. I started with the green lentil stew recipe and replaced the green de puy lentils with red lentils. From there I removed the green kale and replaced it with some tomatoes. I still have a freezer full of roasted red peppers from the fall and I could not resist adding a few of them for even more red. With that I had my red lentil stew recipe. Since I was planning on making some cheesy garlic bread to go with the stew, I threw the rind from that into the stew to add even more flavour. This stew was really easy to make with the hardest part being chopping all of the vegetables but it was well worth the effort! The roasted red peppers went really well with the Italian sausage and red lentils and they really added a ton of flavour to the stew. Although the same amount of red lentils as de puy lentils did not make as predominant a showing in this stew, the red lentil version was definitely tastier! Cook the sausage in a large pot and set aside. Heat the oil in the same pot. All the onions, carrot and celery and and cook until tender, about 10-15 minutes. Add the garlic and chili pepper flakes and cook until fragrant, about a minute. Add the sausage, lentils, chicken stock, roasted red peppers, tomatoes, bay leaf, oregano, balsamic vinegar and parmigiano reggiano rind and bring to a boil. Reduce the heat, cover and simmer until the lentils are cooked al dente, about 20-30 minutes. Season with salt and pepper, remove from heat and mix in the parsley. This looks AH-MAZING! I'm not even the biggest fan of sausage but this looks too good not to try! I agree with Rachael–looks too good not to try! I love lentils of all kinds. Yikes, this looks absolutely wonderful Kevin! I like the way you think when developing recipes ~ I really enjoy utilizing what I have on hand when feasible to create a new dish too. I recently learned about French green lentils. Lentils and yellow split peas are quickly finding there way into many of our meals. I love beans, but my husband not so much, luckily he's okay with peas and lentils! They take less time to cook anyways. This looks awesome, Kevin! And I, too, have some sausage and roasted red peppers in the freezer. Red lentils are definitely a new favorite in our house- I love how they melt into the base of a soup and thicken it up nicely. Great stew. I love lentils. Your photos are stunning as well. This looks very appetizing Kevin. I am both a stew fan and a lentil fan myself. I am convinced now that you put food coloring into your food, otherwise I have no explanation for the vibrancy of your dishes…..just kidding. You are just an amazing cook, Kevin!!! I love the texture of red lentils…gritty and thickening. Kind of. So delicious! The first time I had sausage with lentils was in Santo Stefano di Sessano, a beautiful medieval hill town. A very simple dish but so good! It looks so good with that bread! This is beautiful! I want to reach in and take a bite! Kevin, haven't been here in a while. Nice post. You've got to quit tempting me like this … I just got home from the store, stocking up before a big winter storm, and looking forward to hearty soups and stews … and this looks fantastic. Think I'll make another quick trip to the store. I began cooking with lentils just a couple years ago, and have really come to love them, it's nice to find a new way to cook them. I recommend more people cook lentils. Cheap and healthy food! That's so funny, I just made a turkey sausage vegetable stew for the first time, and it was great. I love cooking just about anything with roasted peppers. Sausage and lentils are such a wonderful combination too. This is a great winter dish! This sounds delicious – kind of like a lentil bolognese! Kevin – when do you put the red peppers into the soup, and do you slice them, or puree them? Thanks – I'm making this one tomorrow! Jenn Sutherland: I just cut the red peppers into bite sized pieces but you could easily puree them if you like. Add them with everything else in step six. I have updated the recipe. Thanks for catching that! Enjoy! I like the sounds of this recipe. Will have to give it a try! Kevin, I love your blog and especially admire your photograhy. I also have a blog but it is quite plain. I need to take time to learn how to present my recipes in a more appealing way. However I do have some good recipes on my blog and one that I think you might enjoy, seeing you have posted lately using Italian Sausage, one of my favorite ingredients. Check out my Italian Sausage Soup recipe. I think you will love it! You have a great blog and both recipes I have tried, including this red lentil stew, came out fantastic. Thanks for very enjoyable reading, cooking and eating! I'm catching up on food blogs, and had to comment because I made something similar for dinner tonight! 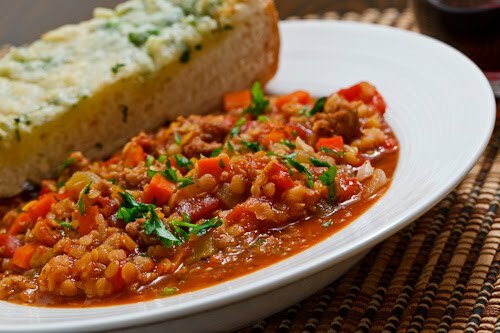 Green lentil stew with tomatoes and roasted red pepper, and a cheesy garlic bread (pizza crust really) on the side. Yours looks even better. After I go grocery shopping I'll have to try it! I was looking for a nice recipe with the Italian sausage because I love it. I think this is what I was looking for. I also love the taste of roasted pepper, it goes so well together. This looks delicious..i have like a kg of yellow lentils i haven't used do you think i could use yellow instead of red lentils? pumakel: Yes, yellow lentils should also work well, thought the cooking time may vary a bit. Just test to make sure that they are tender to see when it is done. İt look yummy. I'll try it quickly. Yours looks even better. After I go grocery shopping I'll have to try it!